Delivery Information– only for purchases made online via our website or by our telephone Websales team. We offer a delivery service with nationwide coverage and usually deliver using our own vehicles and staff - beyond our fleet’s range we use the Palletways network to make kerbside palletised deliveries. Doors and frames are bulky, awkward things to handle, our drivers are trained to move them in a safe and professional way, they are always grateful for help on site but will not be able to negotiate stairs or unsafe surfaces even with a helping hand. Delivery is to the ground floor only or for palletised deliveries to kerbside and you will be asked to check and sign the Delivery Note to confirm the correct number of items have been delivered. We allow 3 working days for the detailed checking of goods and expect any concerns to be communicated to us within that period and critcally before items are adjusted or installed. Our delivery charges are detailed below based on geographic area. Once an order has been received by us, you will be sent an order confirmation email. Your order will then be checked by one of our Door Experts, who will contact you within 4 working hours of placing your order to arrange delivery with you. If you are ordering goods which are out of stock at the time you place your order, our Door Experts will let you know the approximate date when the out of stock items will be expected to arrive. We endeavor to prepare & package all stock product orders within a maximum of 48 hours after receiving notification. The total typical leadtime from placement of order to delivery of the goods is 7 to 10 days, however many orders are satisfled quicker than this. The total typical lead-time from placement of order to delivery of goods on our standard service is 3 to 7 working days for all deliveries, however many orders are satisfied quicker than this. Should you require your chosen products quicker than available via our standard delivery service we now offer a 48 hour delivery option. When this service is selected, and all items are in stock, products will be dispatched for delivery, arriving 2 working days after the placement of the order. The cut off each working day for 48 hour deliveries is 2.00pm. Any orders placed after this time will be processed as if received the next working day. Working days with regards to deliveries are defined as Monday to Friday, with the exception of Bank or public holidays and the Christmas period. We operate a mainland UK delivery service. WILL YOU DELIVER OUTSIDE OF MAINLAND UK? Orders for customers outside of mainland UK can be catered for, however it is the responsibility of the customer to organise the transportation of their chosen goods from our Distribution Centre to the designated delivery address/country. 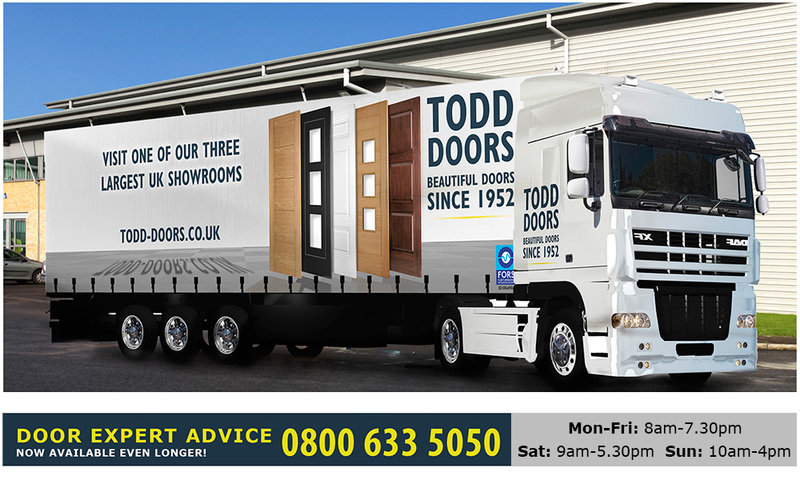 Please contact one of our Door Experts for further information. BT, GY, HS, IM, ZE & PO30 - PO41. Should your delivery address fall into one of these postcode area, please do contact one of our Door Experts who may be able to help you further. DELIVERY OF OUT OF STOCK OR BESPOKE ITEMS? 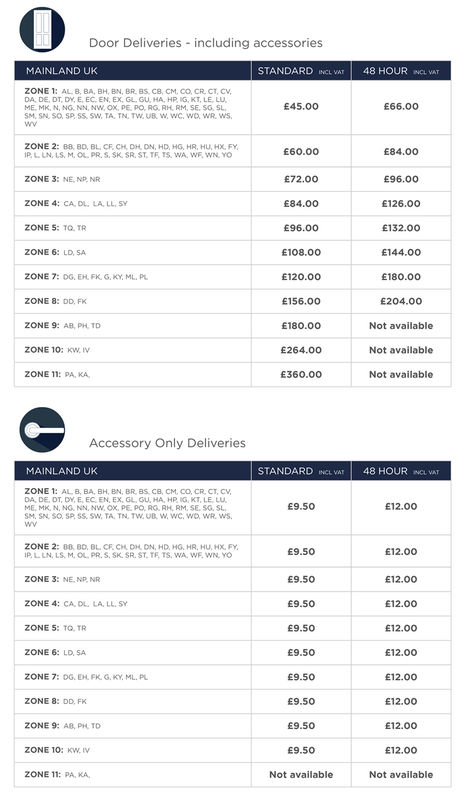 Should you order items that are currently out of stock, on a short leadtime or bespoke/made-to-order, we will ship all of your items, once in stock, within a single delivery as standard. In some instances items within an order may be in stock, should you require these earlier than the outstanding balance of the order an additional delivery charge will become payable. Please speak to a Door Expert for further clarification or to arrange extra deliveries.